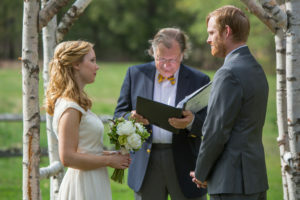 Ideas for elopements, recommitments and small weddings at Vermont DINE inns. We started our series about New England elopements, small weddings and recommitment ceremonies last week. Part I of our series focused entirely on small weddings and elopements in Massachusetts. Since June will soon be busting out all over with weddings, and April and May follow as perfect times for a New England elopement, today we’ll focus on creating small wedding bliss at Distinctive Inns of New England (DINE) in Vermont. No venue can beat one of the 11 Distinctive Inns of New England for recommitment ceremonies, elopements or small weddings. The personalized service, affordability and perfect wedding packages offered by DINE member inns are unmatched anywhere in New England. Let’s start in Vermont, and at the Grafton Inn, wedding central for everything from two-person elopements to 200-person weddings. The Grafton Inn’s wedding packages offer everything from ceremony to reception to Vermont-perfect honeymoons. The staff here is experienced in New England wedding planning. Read the wedding testimonials and you will be convinced that Grafton Inn is a perfect Vermont inn wedding venue. It’s so much fun to see the wedding videos and photos, and when you do you’ll get a good idea for all the variations of size, food, and seasonal themes for weddings here. The Grafton Inn in Vermont is perhaps one of the largest wedding destinations of any of the Distinctive Inns of New England. From Vermont barn weddings, to outdoor tented celebrations to intimate indoor small weddings and elopements, you’ll find the ideal venue and wedding package at the Grafton Inn. Continuing in Vermont toward New Hampshire, the Rabbit Hill Inn offers the ideal spot for a romantic Vermont elopement and/or the intimate and romantic honeymoon. Work with innkeepers Leslie and Brian to make arrangements for your own personalized elopement. They can help find a Justice of the Peace and provide the bubbly and wedding cake afterward. While there are no wedding packages here, you’ll find a number of options for the perfect Vermont honeymoon package. Choose from a 5-day or a 3-day Rabbit Hill Inn honeymoon, complete with couples massages, candle lit dinners, chocolates, roses and dinners. Of course, you’ll start each day out with the Rabbit Hill Inn signature breakfast – enough to fuel you until afternoon tea and pastries each day. Combine the elopement with the honeymoon, and you have the ideal place for both at Rabbit Hill Inn. New England brides-and-grooms-to-be, stay tuned. We’ve now covered Vermont and Massachusetts small weddings. 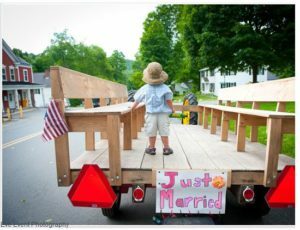 We’ll continue into New Hampshire, Connecticut and Maine weddings with future blog stories soon. Meanwhile, you don’t have to be a bride or groom to be to enjoy a romantic getaway to any of the Distinctive Inns of New England. Book direct with any of the fabulous inns and B&B members of the Distinctive Inns of New England. Credit for header photo: Wedding photo taken at Grafton Inn by Amy Donahue Photography. This entry was posted in advice, Distinctive Inns of New England, Fairy Tale Wedding, Grafton Inn, honeymoons, Rabbit Hill Inn, Romantic Getaway, Wedding and tagged Elopements in Vermont, Grafton Inn weddings, Rabbit Hill Inn honeymoons, recommitment ceremonies in Vermont, small weddings at Vermont B&Bs, small weddings at Vermont inns, small weddings in Vermont, Vermont elopements, Vermont weddings by DINE Blogger. Bookmark the permalink.